It is 1170 – a tumultuous time for the people of Wales, England and Ireland. Raymond de Carew is in love, but the woman he desires is an earl's daughter and so far above his station that he has no hope of ever winning her. 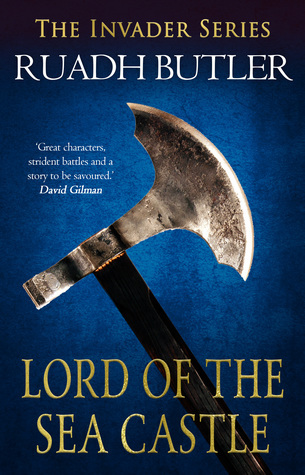 However, Raymond’s lord has a mission for him: one that if it succeeds will put an Irish king back on his throne and prove Raymond worthy – for in Norman society, a man can rise as high as his skill with a sword can take him. With only a hundred men at his side, Raymond must cross the ocean to Ireland ahead of his mercenary lord's invasion. There he will face the full might of the Viking city of Waterford... and either his deeds will become legend or he will be trampled into dust. There are a couple of reasons why I picked this up...1) I wanted a good historical book, 2) I wanted war!! Yes, I got the blood-lust ;D, and 3) It is set in Waterford and I live in a Waterford (not the Waterford that this is set in, but ya know lol). There was a lot of battles and blood and war and I liked it!! It was really good and written well. It was not gross, like some novels can be, and it was not boring and didn't drag on. A nice flow. There was a decent balance with the war/action-y parts versus the "calmer" parts. The balance could've been better, but it wasn't bad. I wish there had been a hair more time with character development and world-building. I didn't feel connected with the main character until about halfway through the book. And I had a hard time seeing the world. Maybe it was just me? It was really interesting seeing this side of the conflict. Mainly books in this time period is written on the English side, so I was happy to read the other side. The love story was okay and it added a human element to the story. Without it, I feel it would've felt more like a history book. I wasn't a fan of the girl tho (heck - I can't even recall her name). I feel he could've done better in my opinion. Her family was a pain. I am curious to see what is going to happen next. There was a little epilogue at the end, but there is so much story left! In the end, this was okay. I loved a lot of it, but there was a lot I didn't like or thought was just okay. If you love or need some bloody historical fiction with a touch of romance, this is the book for you. In the end, I'll give this a 3. I'm curious to see what you'll think of the sequel! Melliane, yes! I hope there is one and soon for sure.